Next time you are having your boots cleaned or the next time you are looking at a new pair of Red Wing Shoes, take a minute and sign up in store for our customer of the month drawing! Every month, at the end of the month, we will draw one lucky winner who will receive a $150 Red Wing Gift card! If you enter once, you never need to enter again. We add names each month to our master list, and draw from there. You could win months from now… Customer service is the core focus of Red Wing Shoes Richmond, and we love giving back to our customers, one winner at a time! We are also now doing contests on Facebook to select winners – be sure to like our page and participate next time we have a contest! Matt Loving won a $150 gift card! He’s been a customer for 10 years now, and gets his boots from the Brook Road Store. He knows his boots by look alone, and he is ready for new pair of those boots. Luckily for him, he won, and that money will go a long way towards his new boots! Congrats Matt! Thanks for participating! Ryan Maitland is March’s Customer of the Month! He’s won a $150 gift card from our Chester store. Ryan wasn’t sure what to buy with his gift card, so we helped him out a bit. He’s thinking he needs an extra pair of SuperSoles for outside of work, and we’re all for it! Thanks for participating in our contest, Ryan! We appreciate it! (Red Wings are) Great and comfortable, not many companies stand behind their boots, nor their maintenance. Going on 15+ years of wearing Red Wing. While he usually wears his Red Wings for work, Jimmy plans on using this gift card to buy a pair of boots for riding his motorcycle. Sounds good to us! Thanks for participating in this month’s contest! Oliver Stacy is our customer of the month for January! 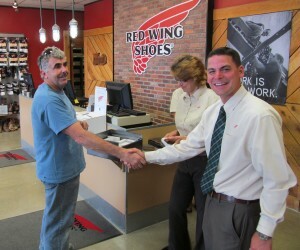 He and his family have been long-time customers of Red Wing Richmond (over 2 decades of patronage! ), and we were thrilled to be able to give back. He’s planning on picking up a pair of pull-on work boots for his welding gig. He’s won a $150 gift card from store that will go a long way towards those boots. Terry’s got your card ready, Oliver… thanks for participating in our Facebook contest! Holly Scholl is our Customer of the Month for December! 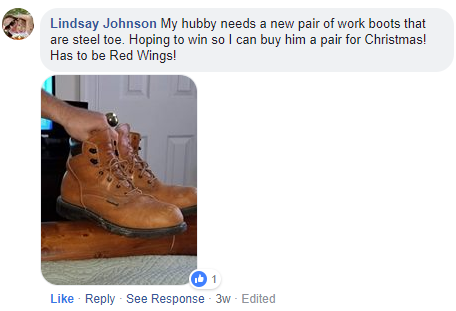 We asked our fans during our monthly Facebook contest to tag their loved ones and let them know what they wanted from Red Wing for Christmas… and they didn’t disappoint! We chose Holly at random, and she won a $150 gift card! Holly’s been a customer of ours for 10 years now, and she was planning on either buying herself a new pair of hiking boots or maybe getting a gift for her son. Either way… one thing’s for sure – there were some new Red Wing Boots under the tree for Christmas! Congrats to our November Customer of the Month, Lindsay Johnson! We had some fun with our contest in November! We asked everyone to a picture of their boots, and Lindsay delivered! She showed us a pair of her husband’s boots, and for that, we hooked her up with a $150 gift card! Thanks for participating guys! Enjoy your new boots! Chris Gartner is our winner for October! Chris has been a customer since 2009. He needed a pair of sturdy boots for his job with the power company – specifically, climbing trees and making sure their branches don’t interfere with the power lines! Red Wings were the ticket, and he hasn’t looked back. He’s planning on picking up a new pair of 8 inch logger boots with his $150 gift card. Thanks for participating in this month’s contest, Chris! Last month, we asked our followers on Facebook to tag a friend that helps them get through the day, either at work or at home. Teri Harris tagged her husband, Bubba, and we selected her as our customer of the month for September! 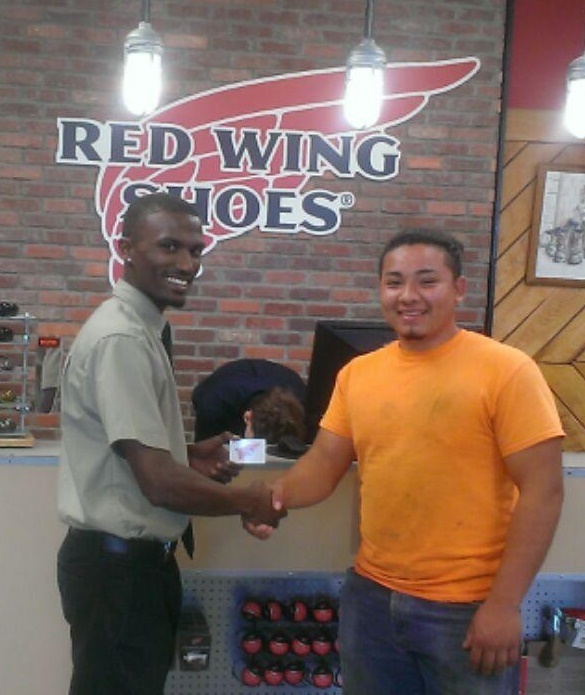 Bubba’s a hardworking guy, and his wife thought he deserved a gift card to Red Wing. So we hooked him up! Congrats Bubba and Teri! Katrina Marie Sprouse won big this month! We decided to do things a little differently last month. We posted a contest Facebook, encouraging our fans and followers to sign up to win! Katina was selected at random, and she couldn’t have been happier. 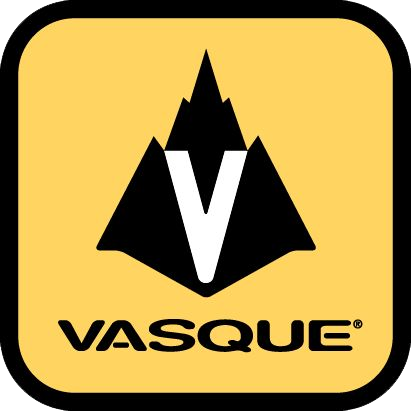 She’s been wearing various footwear from Red Wing Richmond for a decade and a half now,.She was really wanting a new a pair of Vasque Hiking boots, and as you can imagine, the $150 gift card she won from our contest was just what she needed! July’s winner of the customer of the month gift card giveaway is Josh Byrd! Josh has been a customer of ours for 6 or 7 years now, and plans on being one for many more years to come. He works with hazardous chemicals, and as you can imagine, demands the utmost in protection for his feet. Naturally… that led him to Red Wing Richmond! Josh plans on picking up a new of work boots with his big $150 win. We think that’s a great idea, and we’re glad we could help! Jerry Talley is our big winner for June! Jerry’s been a customer of our Midlothian store for a long long time now. He heard of the legendary reputation Red Wing Shoes had for comfort, and knew he needed a pair. Jerry’s got a bad back, and needed shoes that he was able to wear all day long, on any surface, without causing him back pain that night. He found those shoes at Red Wing! He plans on getting a non-insulated pair to keep his feet nice and cool this summer, or maybe a pair for his wife if she needs some. Thanks for signing up Jerry! Enjoy your new boots! Congrats to Christopher Herrin! He’s the Customer of the Month for May! Chris has been a customer for just over a year now, and he’s a big fan of of his Red Wing Footwear. He bought a pair of 8 inch steel toe boots for his job as an electrician, and has loved them. His job has been rough on his boots, and he’s needed some complimentary care for them, but overall he’s loved them! He doesn’t need a new pair quite yet, so he was just planning on stocking up on socks for now and holding the remaining balance til he needed new boots. We think that’s a great idea! Congrats to James Stells! He has been a customer of ours for as long as he can remember, and he was thrilled to learn that he was April of 2018’s winner! He’s been wearing the same pair of 6 inch, steel toed Red Wing boots for 20 years. He’s cared for them, brought them in for their cleanings, resoled them, etc. Just goes to show… they’ll take care of you for a long time if you take care of them! He bought a new pair of Red Wings while he was at the store. Here’s to another 20 years, James! Congratulations!!! Josh Fowler is the big winner for March! 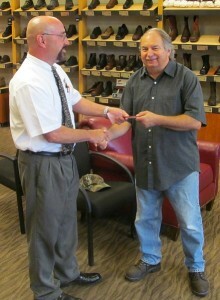 He’s won a $150 gift card to Red Wing Shoes of Richmond. Josh has been a customer of ours for over a decade now. He’s a big fan of our shoes… even if he didn’t pay for his first pair! His first Red Wings were a present from his mom, and we have to say, Josh – your mom has excellent taste! Josh wears Red Wings for his work in landscaping. He loves our safety and steel toe selection…. and tThe timing on his big win was great! 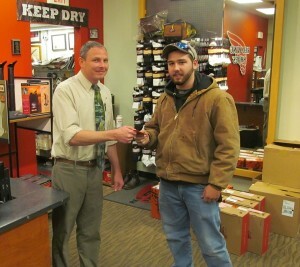 Josh needed a new pair of boots, and with our $150 gift card? He’ll be able to get them for a sweet price! Thanks for signing up Josh! Congrats on the new boots. As for the rest of you? Sign up next time you’re in the store for your chance to win big! Congrats to Ryan Encinas, our Customer of the Month! Ryan has been a customer of our Midlothian store for 15 years now. He’s worked in a few fields over that time frame, but one thing has remained constant… he’s worn Red Wings every day to work, no matter the job! That’s our kind of guy. Ryan wants some insoles for his current Red Wings, and his $150 gift card will cover that easily. He’s also thinking about buying a pair of black, slip-on, steel toe work boots with what’s left over after his first purchase, and we think that’s a great idea! The more the merrier! Thanks again, Ryan. We’re glad to have you as a customer, and we’re glad we could give back to you for your many years of patronage! Enjoy your insoles. Congratulations to Jason Critzer! He is our customer of the month for January 2018! He’s won a $150 gift card to Red Wing Richmond. Jason’s been a customer of our Midlothian location since he moved back to town in 2012. He bought a pair of our 6 inch steel-toed boots to keep his feet dry and protected while working with loggers and in sawmills. He’s still wearing those same boots today! On top of his work boots, Jason’s the proud owner of two of our belts and a pair of our Heritage shoes. He’s planning on buying another pair of boots for the job! Congrats Jason! Thanks for signing up! We randomly selected Krystal Johnson as our big Christmas gift card winner! Krystal was THRILLED to be the big winner! She and her husband have long worn Red Wing Shoes from Red Wing Richmond… for over a decade! Her husband, a pest control expert, was in dire need of a new pair of Red Wing Boots. Krystal had been saving the money to get him a pair… so the $150 gift card she won couldn’t have come at a better time. We’re so happy we could give back to our customers. We hope you all have a great holiday season! Congratulations to Jame Belcher! 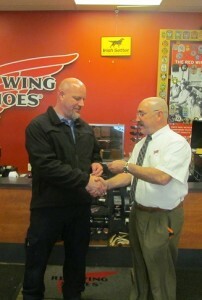 He is the December customer of the month at Red Wing Richmond. He’s won a $150 gift card, just in time for Christmas! James has been a customer of ours for 10 years. He’s bought all his boots from our Midlothian store, and he doesn’t see that changing any time soon! He originally came to Red Wing Richmond like so many others do – in search of a work boot that would help him get his job done! He is an electrician for the state, and needed protective footwear for the job. He is planning on buying a pair of after-work shoes, maybe some of our slip-ons, with his gift card. Even when you’re not working, you should have quality footwear on your feet, and it doesn’t get any better than Red Wing. Congrats again James – enjoy your new boots! Adam Newcomb is the customer of the month for November! He’s the proud new owner of our monthly prize: a $150 gift card to Red Wing! Adam signed up a few months back while having his 8 inch logger boots resoled. He works in a rock quarry, so as you can imagine, he needs Red Wing’s steel toed offerings to give him the absolute best in protection. He plans on buying a new pair of Red Wings with his gift card, but hadn’t decided if he was going to get some more casual boots or another pair of work boots for when his current pair give out many years down the line. One way or another, he’s getting them for $150 less! Thanks for signing up Adam! Congratulations! Congratulations to Tyler Clements! He is the customer of the month for October 2017. He’s won a $150 gift card to Red Wing Richmond! Tyler’s been a customer of our Midlothian location for about 2 years now. He has a tough job… one that calls for the protection of one of our Steel Toed boots. Aware of our reputation for unflinching quality and unbeatable service after the sale, he headed up to our store. He found the boot and fit he wanted in boot 4215! His boots have served him well on the job ever since, and when he brought them in, we took good care of them. He’s not sure what he is gonna do with his $150 gift card, but since it never expires, there’s no rush! Whatever he chooses, he’ll be buying a great American product. Congratulations to Curtis Kiser! He is our customer of the month for September. After signing up for our monthly newsletter back in July, we pulled his entry! 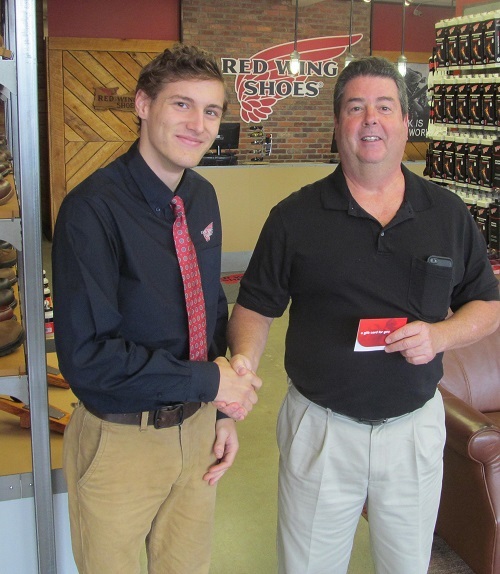 He’s won a gift card worth $150, redeemable at any of Red Wing Richmond’s 3 stores or our Charlottesville location! Curtis works for Dominion Power, and was in the store to get a pair of work boots when he signed up. His co-workers had ranted and raved about Red Wing Shoes’ legendary durability, protection and comfort… and Curtis decided to see for himself if our work boots lived up to the hype… and he wasn’t disappointed! Since he just bought Red Wings work boots a few months ago, he won’t need new work footwear for a very long time. He is thinking he might use the gift card on some of our boots that are more suited for recreation, or maybe just hold on to the card for when he needs a new pair of boots many years down the line! Congrats again Curtis… thanks for signing up! Forrest Cole is the customer of the month for August! He is now the proud owner of a $150 gift card to Red Wing Richmond! 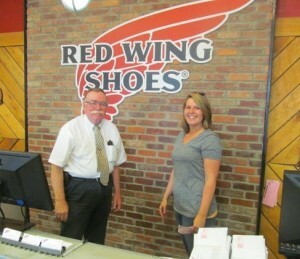 Forrest is a long time customer of Red Wing Richmond’s Midlothian location. 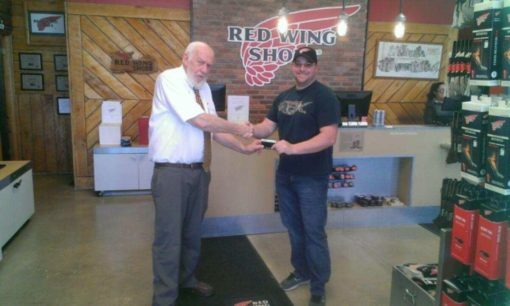 He first bought Red Wings in 2008, and has been a loyal customer ever since! His job as a field service engineer was demanding on his feet – specifically the balls of his feet. Crouching all day in sub-par boots eventually led to some minor nerve damage for Forrest, and that was the final straw. He headed up to Red Wing, and the rest is history! He has been happily wearing Red Wings for close to a decade… and it’s been a pain free experience! He is planning on getting a new pair of boots with his $150 gift card. A great investment! Congratulations again Forrest! Congrats to Christina Brown, patron of our Brook Road loaction! She is July’s Customer of the Month. Christina has been a customer of ours since last summer. She had heard about Red Wing’s legendary reputation for comfort, and decided that she wanted an upgrade. She picked up a nice pair of work shoes, and she’s been happily wearing them ever since! She plans on buying a new pair of shoes with her gift card. We think that’s a great idea! Ray Clary is June’s Big winner! 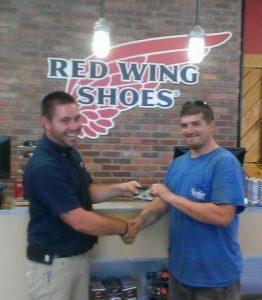 Ray, the lucky Customer Of the Month for June 2017, has been a customer of Red Wing Shoes for over 10 years now. He frequents our Brook Road location. He works in automation – and all that time on factory floors can really take a toll! He found out early on that he needed the very best in work boots in order to stay on his feet the whole day, so naturally – he was drawn to Red Wings! He plans on buying a new pair of work boots with his $150. Darrell Smith is May 2017’s Customer of the month! He is a long time customer of our Brook Road store. When we got in touch with Darrell, he was so busying getting work done he barely had time to accept his gift card… but he was still excited to be our winner! 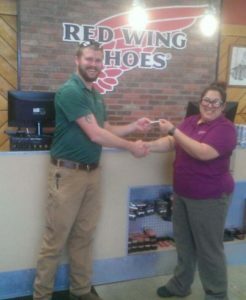 He wasn’t sure what he planned on buying with his new found $150, but since he is such a big fan of Red Wing, we’re sure he will find something! Austin Turek is April of 2017’s big winner! 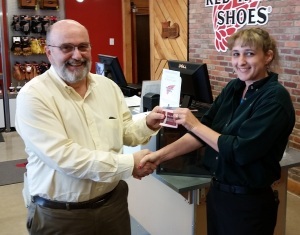 As the winner of our customer of the month program, he’s earned himself a $150 gift card to Red Wing Richmond! Austin has been a customer of ours for a couple years now. He first bought Red Wings to protect his feet while working with concrete. However, he recently upgraded jobs and was in desperate need of a new pair of work boots – so that’s what he’s going to use his gift card on. Talk about perfect timing! Congratulations are in order for Jesse Jones! He is our March winner of the Customer of the Month Program! Jesse is a 30 year customer of Red Wing Shoes, and has been coming to our Midlothian location for Red Wing work boots for longer than he can remember. He works with epoxy, which can be hard on boots – which is why he’s a Red Winger! He is planning on getting a new pair of Red Wings for work in a few years with his gift card. We couldn’t think of a better investment! Congrats Jesse! Congrats to Gordon Salmons – he’s February of 2017’s Customer of the Month! 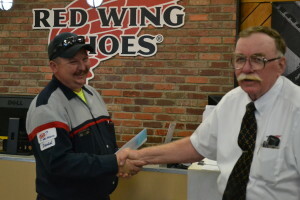 Gordon has been a customer of Red Wing Shoes for over 20 years, and recently bought his newest pair of Red Wings from our Midlothian location. He needed a pair of well made, protective and good looking boots for long rides on his motorcycle, and he knew that Red Wing was the place to go. He’s planning on buying a pair of Red Wing hiking boots with his $150 gift card. He’s soon hitting the Appalachian Trail for a couple months, and needs quality boots strapped to his feet to tackle the rigors of the trail. Sounds like a ton of fun! New Year, new winners! Congratulations to Chad and Rochelle Williams – they’re the first Customers of the Month for 2017! 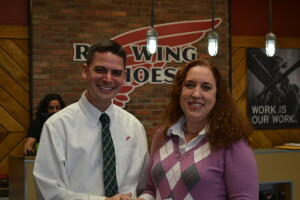 Rochelle signed up last October when she was picking up her first pair of Red Wings. The City of Richmond wanted to outfit their workers with the best work boots in the world, so naturally they chose Red Wing! 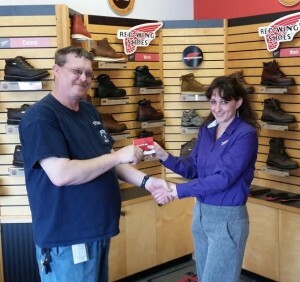 Rochelle and Chad plan on using their gift card to pick up a pair of Red Wing work boots for him. Fed-Ex has recently changed their safety boots standards to non-slip, and Chad needs a new pair. Talk about perfect timing! Congrats guys – enjoy your next pair of Red Wings, and Happy New Year! Congratulations to Walter Marley! He is December’s winner of our Customer of the Month program. He’s won a $150 gift card, just in time for Christmas! 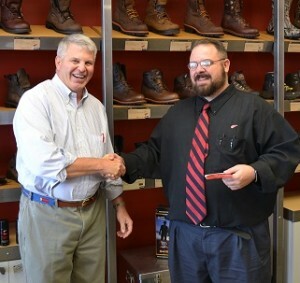 Now is the perfect time for Walter to use his gift card towards the purchase of a brand new pair of Red Wing boots! Congrats Walter! Thanks for signing up, and Happy Holidays! Congrats to Oscar Duarte, November’s Customer of the Month! He’s won a $150 Gift Card to Red Wing Richmond! Oscar first learned about the legendary quality and durability of Red Wing Shoes from his brother. They headed up to the Midlothian store about six months ago for some new boots for his job with Verizon, and he signed up for our customer of the month program while buying a new pair of Irish Setters. What he didn’t know was, the boots weren’t the only thing that he was going to get from Red Wing Richmond this year! Oscar’s planning on getting another, different pair of Irish Setters with his gift card. Congrats again, Oscar! Thanks for signing up! Congrats to our October Customer of the Month – Debra Harby! She’s won a $150 Gift Card to Red Wing Richmond! 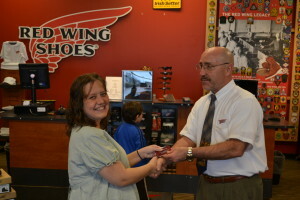 Debra first heard of Red Wing when she checked out our Midlothian location with her son-in-law. He is an EMT in Amelia County, so naturally he’s a huge fan of Red Wings! She figured she’d sign up to win while he was having his Red Wings cleaned… little did she know she would be our winner! She plans on using her $150 gift card to get a new pair of boots as a Christmas present for her son-in-law. We should all be so lucky! Congrats again, Debra! Thanks for signing up! Congratulations to Josh Byrd! He is September’s winner of our Customer of the Month giveaway! He’s won a $150 gift card to Red Wing Richmond. 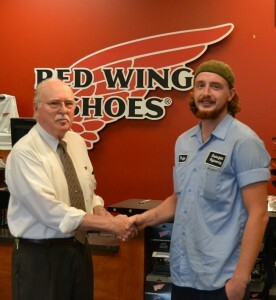 Josh has been a customer of Red Wing Midlothian for a few while now. He bought a pair of slip-on Pecos a few years back and has been coming in for regular service ever since. The slip-on pecos offer him outstanding protection and grip in his job working with chemicals. Josh plans on buying a pair of our Engineer boots with his gift card. Congrats again on the win, Josh! Congrats to Bryan Gillespie, August’s customer of the month! He’s the proud owner of a $150 Red Wing Richmond gift card. 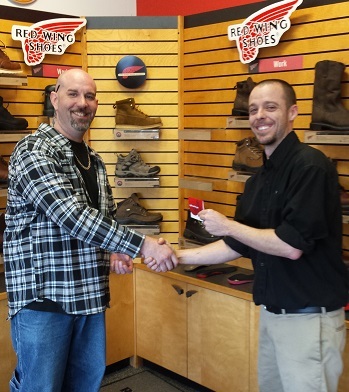 Bryan, a customer of our Midlothian location, has been wearing Red Wings for three years now. He sought out Red Wings for their legendary reputation. His job as a welder means that he needs to the absolute best in protective footwear in order to get the job done and keep all his toes! Interest fact about welder’s boots… they prefer slip-on boots. It’s an easy choice, since the laces on other boots can catch fire while welding. No thanks on that! Bryan bought a pair of our steel toe slip-ons recently, so he won’t be needing any boots for awhile. Fortunately, our gift cards are good for life, and he plans on using his gift card a few years down the road if/when he needs a new pair! Congrats again Bryan! Thanks for signing up! Congratulations to Jeff Jenkins, our July Customer of the Month! Enjoy your $150 Gift Card Jeff! Jeff frequents the Red Wing Chester location, and he absolutely loves his Red Wings! His Red Wings really help him get through the long days in the HVAC industry. 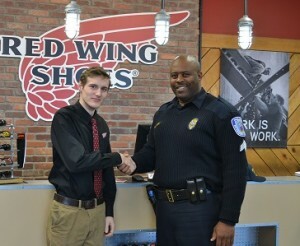 In fact, when we caught up with Jeff, he had just bought a new pair of Red Wings from our guys in Chester! Since Jeff just bought a new pair, he will probably sit tight on redeeming his gift card. No worries… that gift card is good for life! Congrats on your big win Jeff! A huge congrats to Steve Hathaway! He was selected to be the winner of June’s Customer of the Month $150 gift card giveaway! Steve has been a customer of our Midlothian location for 15 years now! He signed up a while back and was very surprised when he was selected. Steve works for Dominion, and needed a great pair of boots for his work. He settled on a pair of our pull-on cowboy boots, and has been a satisfied patron of Red Wing ever since! He’s planning on using his $150 gift card to get another pair of our boots. Congrats again, Steve! Enjoy your new boots! Congratulations to Tom Barnes! He is the May winner of our Customer of the Month program. Tom has worn Red Wing boots for 35 years. He first started buying them in 1981, after getting tired of his big-box store boots falling apart on him every few months. 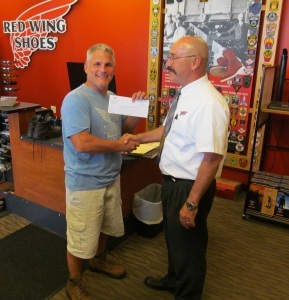 He decided to head up to one of our San Diego stores and pick up a pair of Red Wings… and the rest is history! He’s had Red Wings on his feet ever since, and his boots have served him well throughout his long career. We love hearing stories like this… it’s why we do the drawing in the first place! Congratulations Tom! Congratulations to our April Customer of the Month, Garrett Adams! Garrett is a long time customer of our Chester location. He is a 17 year veteran of the Chesterfield Fire Department, which was where he was first introduced to the amazing quality of Red Wing’s steel toe boots. Since then, he’s continued to buy Red Wing Work Boots at our Chester store, and considers our guys up there to be like family. Congrats to March’s Customer of the Month, Greg Rentz! He’s won himself a $150 gift card to Red Wing Richmond. Greg has been a customer of our Midlothian location for 10 years! He wears steel toed pull-on boots for his favorite hobby… motorcycling! A few years back, he took a nasty spill when a truck almost ran him over on his Harley. He credits his Red Wings with saving his foot. We’re glad he was wearing our boots that day, and so is he. Stories like these are why we do this awesome giveaway every month! Congrats Greg! Thanks for signing up! A big congratulations to our newest Customer of the Month, David Graham! He’s February’s winner of our $150 gift card giveaway. David works for DuPont and is a long time customer, owning 3 pairs of Red Wings. We picked him at a great time, as he was looking to pick up his fourth pair soon! He’s got 2 pairs of Red Wing’s Irish Setters and a pair of standard steel toed boots for work. He’s not sure what his fourth pair will be, but he’s excited about picking them out! Congrats again, David! Hope you enjoy your new boots!! Congratulations to Vince Gagliano! He’s January’s Customer of the month. Vince is a long time customer of our Brook Rd location and signed up to win there a few months ago. Unfortunately, we weren’t able to get a pick with Vince but rest assured; he’s now in possession of a $150 gift card to Red Wing! Congrats Vince! Enjoy your big win! Congratulations to Stacy Henry! 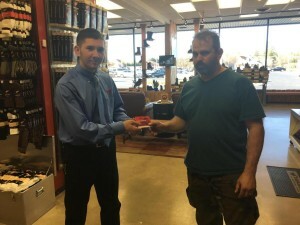 He is the December winner of our customer of the month gift card giveaway. Stacy is a 5-year customer of Red Wing Shoes, and owns 5 pairs (and more to come) of our shoes and boots. Stacy is a Richmond Police officer, and his beat is in schools throughout the Richmond area. 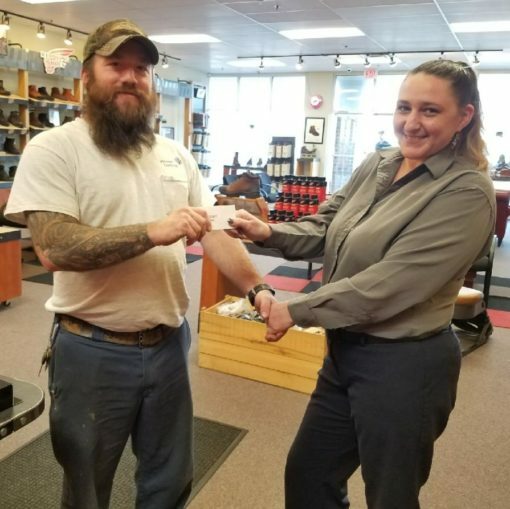 Stacy’s first experience with Red Wing was a great one; he said he walked in, got the perfect fit on the very first try, and has been a loyal customer ever since. Stacy’s not sure what his sixth pair of Red Wings will be. However, Red Wing Boot 8109, the Classic Oxford, caught his eye! Either way, we’re very happy for Stacy! Thanks for your service to the community, and congratulations! Congratulations to Christopher Stephens! He is November’s customer of the month! Christopher is a long time customer of our Brook Road location, and signed up to win his $150 gift card list time he was in the store. Since he already had a pair of Red Wings for his job, he already knew all about our legendary quality and durability! He plans on buying a pair of Red Wing Hiking Boots with his $150 gift card. With the weather starting to get nasty and cold, we couldn’t think of a better purchase! Congratulations Christopher… thanks for signing up, and enjoy your new boots! Congratulations to Bo Whitehurst! He is October’s winner of our Customer of the Month contest! 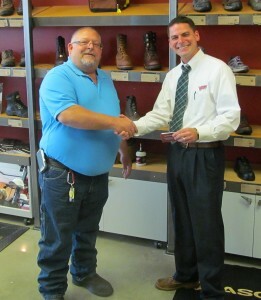 Bo signed up a few months ago and is a long time customer of our Red Wing Shoes Midlothian store. Funny story about Bo’s big win: He was actually our September customer of the month, but we weren’t able to reach him at first. About five minutes after we moved on to Wayne (below), Bo gave us a call back! We worked it out by moving him to October. Like our August winner, Bo was eyeing a pair of our Red Wing Oxfords when we met up with him at our store. He was planning on buying them on his next trip! Congratulations Bo! Thanks for signing up, and hope you enjoy your new Oxfords! Congratulations to Wayne Hatch! He is September’s winner of our Customer of the Month contest! Wayne works for the Chesterfield County Environmental Engineering department, and his department has a contract with Red Wing shoes… so he’s very familiar with the impressive quality of our boots and unmatched service. Wayne is a customer of the Chester location, and signed up to win a few months back while we were performing our free monthly servicing on his boots. 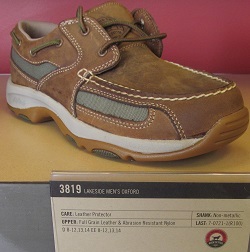 Wayne plans on buying a pair of Irish Setter VaprTrek 2870’s with his $150 gift card. It’s getting into hunting season now and he wants to be well equipped for whatever the hunt requires… and he couldn’t have picked a better boot for it! Congratulations Wayne! Enjoy your new boots and good luck on your hunts this year! Congratulations to Michael Layne! He is August’s customer of the month. He signed up last month at our Midlothian store. Michael has been a customer of Red Wing for years, and after a job change, he no longer needed a rugged pair of work boots. He headed up to the store and picked up something a little more casual: Red Wing’s Lakeside Oxfords – an outstanding choice! As he was paying for his awesome new shoes, his wife suggest he sign up… and here we are! He wasn’t quite sure yet what he was going to buy with his $150 gift card, but since it never expires, he’s got quite a long time to decide! Congratulations again to Michael… thanks for signing up! Congrats to Margaret Holmes! Her and her husband signed up for our $150 customer of the month program just a few weeks ago when they were in the store, looking for a new pair of boots for him! They are long time customers of our Midlothian location, and were extremely excited that they had won! Our store manager, Dee, was also excited: she said that them getting drawn to win couldn’t have happened to two better people! They weren’t quite sure yet what they were going to buy with their gift card, but as we’ve mentioned before… the balance never expires, so they thought maybe they’d spend it in 5-10 years when they needed a new pair of boots! Thanks again to Margaret and her husband for signing up… as always, keep the signups coming! Congrats to Dr. Charles Terry, our June Customer of the Month! Many of you probably recognize Dr. Terry… he’s been practicing pediatrics here in Richmond for years, and was just recently recognized as one of Richmond “Top Docs” by Richmond Magazine! Dr. Terry speaks very highly of the quality, durability and longevity of Red Wing boots… as is evidenced by the fact that he’s been a customer of ours for over 20 years! He first pair of Red Wings was for bird hunting, and since that purchase years ago he’s bought a handful of different boots. Thanks for your loyalty Dr. Terry! We appreciate all you’ve done over the years to raise these kids here in Richmond… the least we can do is make sure your feet are warm and dry when you’re not on the job! Congratulations to our May 2015 Customer of the Month, Wendy Correa! Wendy was shopping at our Midlothian store a few months back and signed up to win. She was extremely excited to win our $150 gift card and had a number of things she was thinking about spending it on! We couldn’t get a picture with Wendy picking up her gift card due to her having a very busy schedule (like all of our customers, Wendy is a hard worker!) but needless to say, she was very happy about being selected! Congratulations Wendy, and thanks for signing up! We will be drawing the next customer of the month soon, so, as always, keep the signups coming! Congratulations to our April Customer of the Month, Laci Wills! Laci signed up just a few weeks again when she was in the store with her husband! They were looking for a new pair of work boots, and she figured she might as well sign up! A funny thing happens with our winners when we let them know that we drew their name – about half of them don’t believe us! Rest assured, if you get a ring from our marketing guys saying you’ve won, it’s the real deal. Laci said she’d never won anything like this before, so we’re okay with calling it first timer’s luck that she won a $150 gift to the best work boot store in the country! Congratulations Laci, and thanks for signing up! Your $150 never expires, so once you guys decide what you want to buy, you’re good to go! As always, keep the signups coming! Congratulations to our March Customer of the Month, Brian Martin! Brian works for the Virginia Department of Transportation and is a longtime customer of Red Wing Shoes. His first pair of Red Wing boots were 8 inch, multipurpose and served him well for a long long time.. In December, Brian stopped by our Brook Road location and bought a pair of 6 inch waterproof zip-ups that he currently uses for work. While he was in that day, he decided to take a chance and sign up for the Customer of the Month drawing… which turned out to be a great idea! Since Brian just bought a new pair of Red Wings in December, he’s planning on holding on his gift card for a while. No worries there! The $150 never expire, so the next time he needs a pair of work boots, we’ve got him covered. Thanks for signing up Brian! We’re looking forward to the next drawing, so keep the signups coming for your chance to win! Congratulations to our February Customer of the Month, Doug Saunders! Doug earns his paycheck taking care of the HVAC needs of the fine folks over at the Chesterfield Air Park. He was having his Irish Setters cleaned last fall when he figured he might as well sign up to win the gift card. Seems that worked out well for him! He’s not sure yet what he’s going to buy with his $150, since his Irish Setters are still going strong (as they are known to do!) His friends at the air park have some ideas, though – many of them have already gently reminded Doug that they need some new boots. Doug – tell them to sign up for the gift card giveaway like you did! Thanks for being a customer of Red Wing Brook Road. We’re looking forward to the next drawing, so keep the signups coming for your chance to win! Congratulations to our January Customer of the Month, Cory Allen! Cory signed up a long time ago at our Chester location when he was working at a different job that didn’t require specialized work boots. However, as we all know, things change! Now that he works as an electrician for the justice system within the Chester area, Cory needed some new, shock dissipative boots! He plans on buying a pair with his $150 gift card. Talk about great timing! 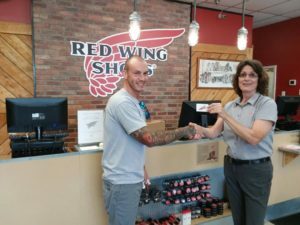 Cory – thanks for being a customer of Red Wing Chester! We hope you all keep the signups coming! Congratulations to our December Customer of the Month, Stephen Vickers! Stephen works for Atlantic Heating and Cooling in their HVAC department. 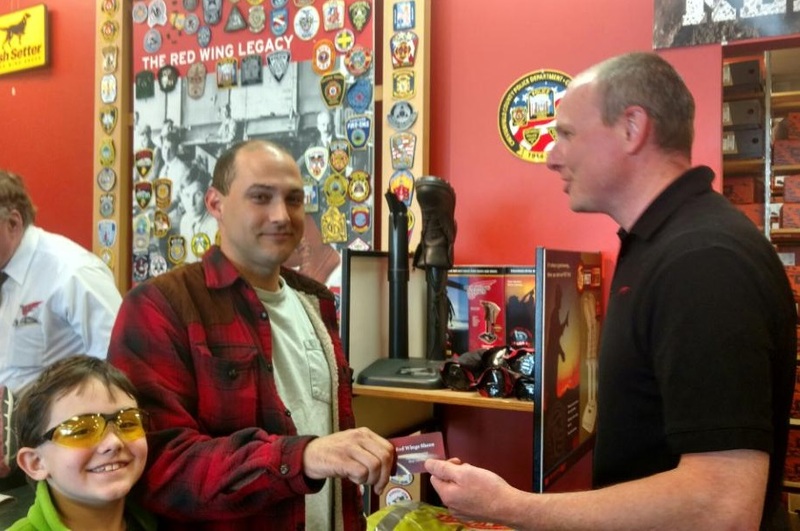 He signed up only a couple weeks ago when he bought his first pair of Red Wings boots, and like quite a few of our winners, was shocked to get the call that he had won! Now he’s got a cool $150 to get all the cleaning supplies, accessories and care products that he needs! Thanks for being a customer of Red Wing, Stephen. Keep the signups coming! Congratulations to our November Customer of the Month, Jeff Donahue! Jeff works for the Richmond Metropolitan Authority and signed up when he was in having his shoes cleaned and cared for. Sure enough, when we snapped this picture, Jeff was having them cleaned and serviced again! Jeff’s a great example of someone that takes care of our free monthly cleaning program, something we offer all of our customers. We’re happy that he won this $150 gift card in time for the holidays. He hadn’t decided what he was going to spend it on yet, but there’s plenty of time before Christmas! Thanks for signing up Jeff! Enjoy the holidays! Congratulations to our October Customer of the Month, Joe Lynch! Joe is a civil engineer that works on various local government projects throughout the commonwealth! Joe signed up to win in all the way back in April, but the timing of this gift card couldn’t be better! Joe’s been hitting the gym hard lately, and was looking for work shoes that offered a little more support in the heel. Fortunately, Red Wing has orthotics that can make any shoe a dream to walk in, and we had plenty of boots on hand that would work for Joe perfectly! Thanks for signing up Joe! Enjoy your new boots! We’d like to congratulate the September winner of our $150 gift card, Gerry Mauger! Gerry’s a big-rig hauler for UPS and has been a Red Wing Boot wearer for a long time. 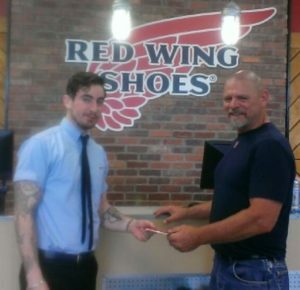 Gerry used the gift card we gave him to buy a new pair of Red Wings on the spot! Gotta love that! Gerry plans on using his new boots on the job. As for his old Red Wings? With a ton of life still in them, his old Red Wings are his new outdoors and yard work boots! 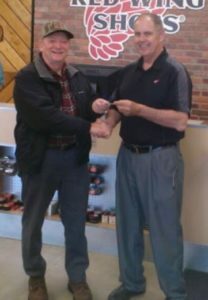 Congrats Gerry, enjoy your new pair of Red Wings! We couldn’t be happier with our August Customer of the Month, Mike Tripp! Mike works as a Millwright at Dupont, where he and his team work on and fix machines daily. He’s proud of his 40+ years serving Dupont, which is incredible. As they say….they just don’t make ‘em lilke they used to! Mike’s worn Red Wing boots for well over 25 years, and he routinely tells his friends, family and coworkers about how much he loves Red Wing boots. Mike’s purchased just about every type of Red Wing over the years, from 6 inch work boots to hunting boots, dress boots and even casual shoes. Here’s our girl Abigail congratulating Mike! Abigail enjoys loyal clients like Mike, who she can honestly get to know over the years. Thanks for your business Mike, and thanks for your loyalty. Enjoy a free pair on us! Congratulations to George Davis of Chester! He’s won our monthly $150 gift card giveaway. 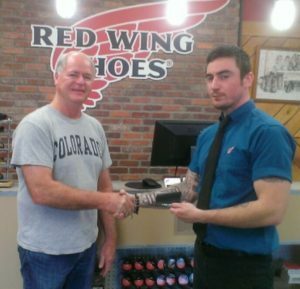 George has been a customer of the Chester location for over a decade, and his son has recently bought his first pair of Red Wings! George was planning on using his gift card to pick up some care products for his son’s new footwear. We’re always happy to see old and new members of the Red Wing Shoes Family! Thanks for signing up George – we hope both you and your son enjoy your Red Wings! Remember to keep the signups coming – you could be the next recipient of a $150 gift card to Red Wing Shoes! Congratulations to Willie Nelson of Midlothian! He’s won our monthly $150 gift card giveaway. Willie works all over the world and relies on his Red Wings to get him to work and keep him safe while he’s there. 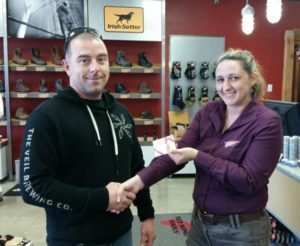 He signed up to win the contest when he was at our Midlothian location, buying the best work boots in the world for his oldest son. Once his youngest son heard about this, he wanted a pair too, and Willie plans to use his $150 gift card getting him one! We’re happy to welcome the whole Nelson crew to the Red Wing of Richmond family. Thanks for signing up Willie! Congratulations to Frank Foster, our May Customer of the Month! Frank works in the HVAC industry and depends on his Red Wing #1447’s to protect his feet throughout the day. Frank’s wife signed him up for our contest when she brought in his boots for their free monthly cleaning. Frank was eager to spend some of his new gift card on one of Red Wing’s genuine American leather wallets, and even got to meet our man Bill Gardner, owner of all three Richmond area Red Wings! 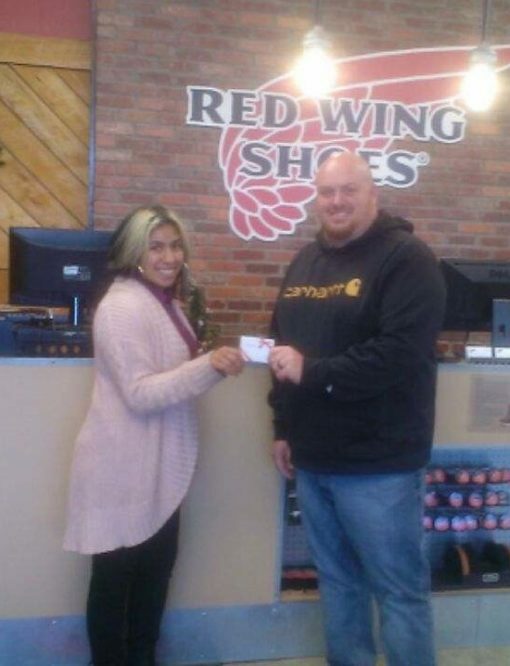 Whether you’re signing up for yourself or your loved one like Frank’s wife, you could be the next winner of a $150 gift card from Red Wing Shoes! Congrats to Daniel Crawford, our April Customer of the Month! 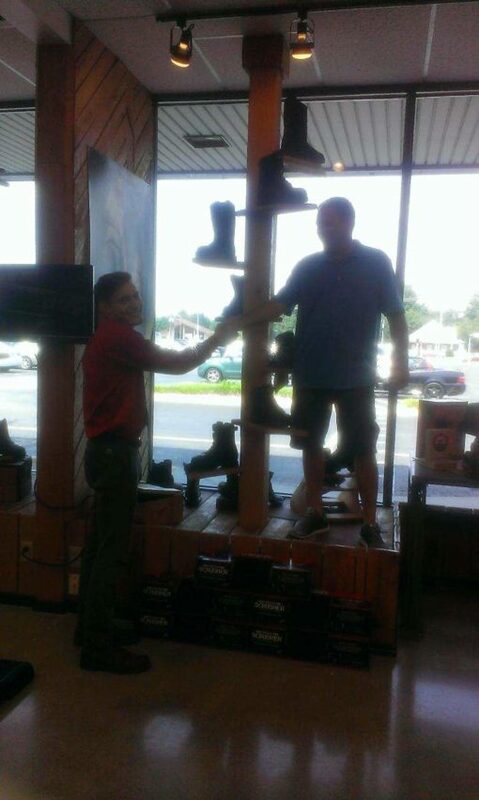 Daniel is a classic Red Wing Richmond customer… hard working, no nonsense, loyal and patriotic! Daniel owns several pairs of Red Wings, and wears his black 2412’s to work every day at AAA Mid Atlantic. Since 2004, he’s not only worn his Red Wings with pride, but he’s also helped spread the word about the Red Wing experience to his dad, his brother and others! Thank you Daniel for your loyalty and support. Customers like you make Red Wing Richmond who we are today. 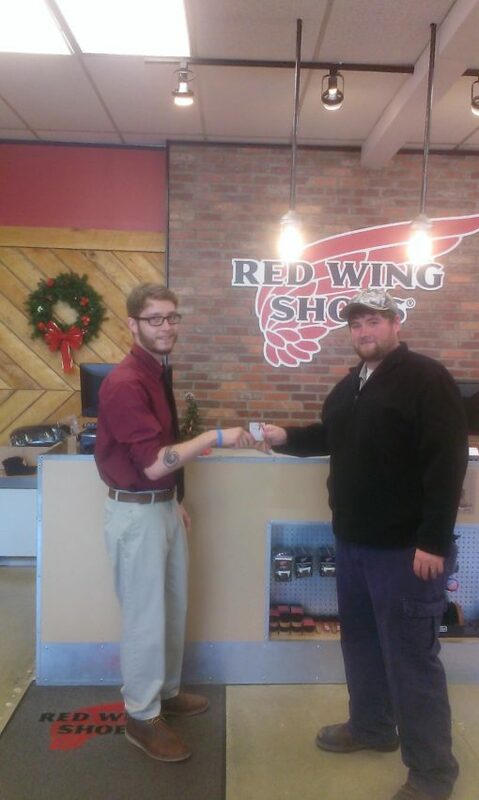 Congratulations on your $150 Red Wing gift card, and we look forward to serving you with pride for you years to come. Remember….you only have to sign up once at any of our three Richmond area locations, and you’re always eligible to win a $150 Red Wing gift card! Congratulations to Angie Adams! She has been selected as the winner of March’s Customer of the Month $150 gift card giveaway! 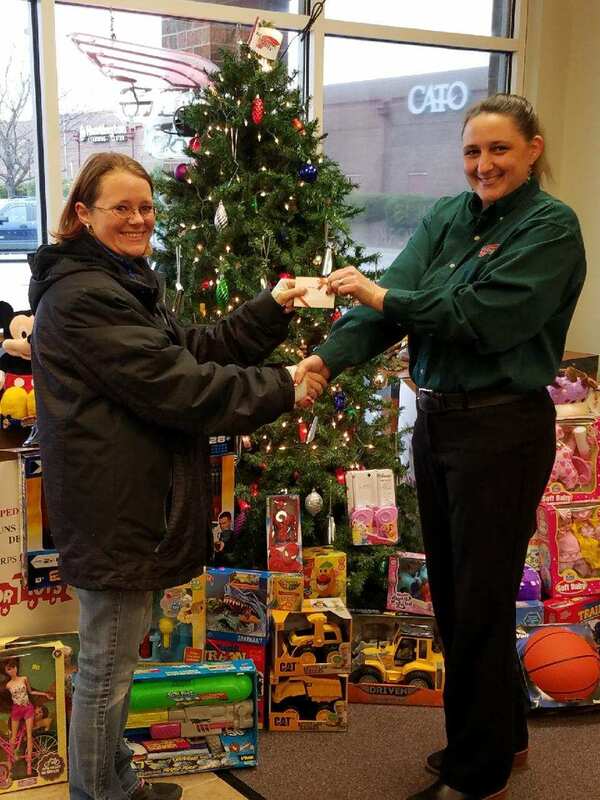 Angie signed up for her husband, a firefighter in Enon and longtime customer of our location in Chester! Her husband already had two pairs of Red Wing boots (one for work, one for home,) and was planning on picking up a cleaning kit as well as a bunch of other great accessories to go along with his Red Wings. We hope you guys enjoy your gift card – We’re always thrilled to hook up someone who helps people and saves lives for a living! Keep the signups coming, and you could be next! Holly is an IT worker, employed by VCU Health Systems. Holly lives just blocks away from our Midlothian Location, and is a proud mother of 24 year old son who lives in Powhatan. Holly’s actually never owned a pair of Red Wings before – though for years she’s taken in her “other” boots to Red Wing for cleaning and repair. Of course, we’re always happy to help! Holly’s fiancée Jason, a proud owner of a pair of black WORX boots, is a truck driver contracting with the Home Depot. He loves his Red Wing boots, and swears by Red Wing Shoes and our service. He’s known Paul and the guys at Red Wing Midlothian for several years, and even brings in Holly’s legendary fruitcake cookies on occasion for the crew. For some reason, however, none of the other employees can recall ever seeing one of these cookies except Paul…. Please congratulate Holly McGuire, our February Customer of the Month! EDIT: We heard back from Holly! “I just wanted to share a quick note to say how excited I am about being able to get a pair of Red Wing Shoes shoes for myself – in fact I bought two! Not only does my son and fiance have hunting and work boots (respectively) purchased from Red Wing – but now because I wear my new shoes all the time, my Aunt has purchased a pair! I purchased a pair for my Mother this past weekend and several older neighbors and co-workers have expressed interest in checking out Red Wing as well. Thank you again for selecting my name as February’s winner! Sincerely, Holly McGuire” You are more then welcome Holly! Customers like you are why we love doing what we do! Congrats to Larry Graham, December’s Customer of the Month! Larry is a long-time customer of Red Wing Shoes. He’s got a pair of our steel-toed 6 inch workboots and a pair of loafers for less demanding work. He’ll be using his $150 gift card to pick up his 3rd pair of Red Wings. Congrats to Joey Cordo, November’s Customer of the Month! Joey is a recent customer of Red Wing Shoes. He sports a pair of our steel-toed 8 inch boots. Joey – our Chester location has your $150 gift card ready! Congrats to Shane Evans, October’s Customer of the Month! 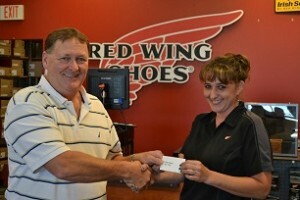 Though Shane is a new customer of Red Wing Shoes, his wife is a lifelong patron! She convinced him to buy the best shoes he’ll ever wear – a pair of 6551 WORX boots. He wears his new Red Wings around the kitchen at culinary school. Shane – our Chester location has your $150 gift card ready. Congrats to Jason Harkness, September’s Customer of the Month! Jason is a new customer of Red Wing Shoes. He signed up to win the day he bought his first pair of Red Wings. 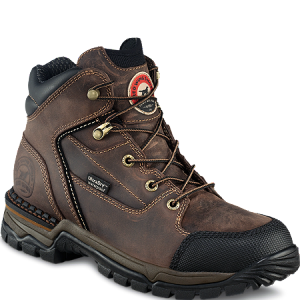 He wears his 8 inch, insulated and waterproof boots on the job with Rockingham Steel. Jason – our Midlothian location has your $150 gift card ready. Congrats to Heather Nettleton, August’s Customer of the Month! 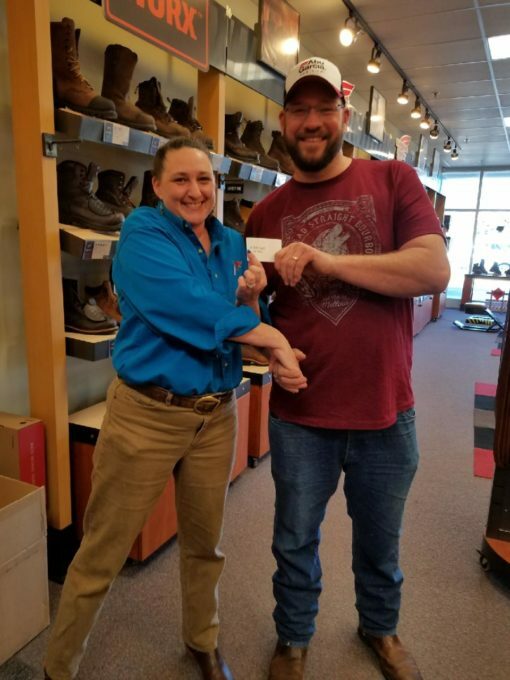 Heather, a lifetime customer of Red Wing Shoes, signed up to win the day she bought her husband a pair of 6 inch, insulated and waterproof boots for his job in the HAZMAT transportation industry. Thanks to Heather, he is now a true believer in Red Wings! Heather – our Chester location has your $150 gift card ready. Congrats to Travis Heath! You are July’s customer of the month! Travis, a new customer, works in the Commercial Refrigeration field and wears WORX boots with Red Wing insoles. Travis – our Midlothian location has your $150 gift card ready! Click Here to learn more about our Industrial Safety Footwear Program.